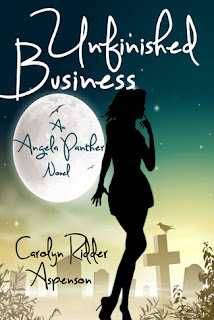 Today I am doing a cover reveal for the second book of the Angela Panther Series. Why? Because I have the first book, which I will be reviewing soon hopefully! And because I really like the cover art and the author!!! So here it is!! When Angela's best friend Mel thinks her husband is having an affair, she turns to Angela for help. The two come up with the perfect plan to catch him in the act but to make it work, they'll need help from Angela's mother, Fran. There's just one teeny, little problem. And since Angela's psychic gift is currently out of service, connecting with Fran is a little complicated. While Angela searches for a way to fix her psychic radar Fran and a multitude of other ghosts continue to try to make a connection. And it's driving Angela crazy. But Fran won't let her daughter's problem stop her from helping someone she loves and she sets out to catch the cheater on her own, using a few tricks and tools from the afterlife to get it done. Book two of the Angela Panther series will be available November, 2013 in e-book and paperback. When Angela's mother Fran dies and comes back as a ghost, Angela's ordinary life turns into a carnival show, starring both Angela and her nosy, dead mother. It seems Fran's got some unfinished business on earth and she's determined to get it done, no matter what. When Fran returned, she reignited her daughter's long suppressed psychic gift, one she neglected to mention to Angela, and now Angela sees ghosts everywhere. And they won't leave her alone. Fran can't help but stick her transparent nose where it doesn't belong, making Angela's life even crazier. Now Angela has to find a way to keep her old life in tact and help the dead with their unfinished business, all while trying to keep her dead mother out of trouble. And it's a lot for one woman to handle. Hello! Nice to meet you. This has absolutely nothing to do with the post which you have a skill for writing reviews--no lie. But I had to stop by and say AKDSLFAJ; THANK YOU SO MUCH FOR THE FOLLOW! <3 IT MEANS SO MUCH TO ME. I hope I can get to know you, your blog much better. Maybe become friends?